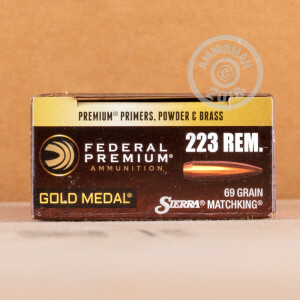 This 200 round case of match grade .223 Remington ammunition from Federal is a favorite of competition shooters and professionals who can't afford to miss. Designed and crafted to be as accurate as you are, this ammo uses the famous Sierra MatchKing 69 grain boat-tailed hollow point as well as the most reliable non-corrosive Boxer primers and brass cases selected for their uniformity. Expect a muzzle velocity of 2,950 feet per second, slightly slower than M193 or M855 ball ammo but fast enough to retain the .223's flat-shooting characteristics. 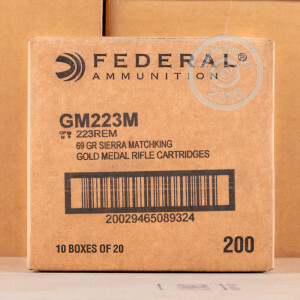 Federal's Gold Medal Match series is available in a variety of popular cartridges and occupies a strong niche in the precision shooting market due to its uncompromising quality. 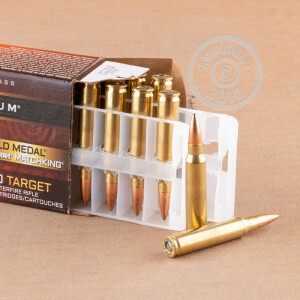 Although the extraordinary care used in manufacture this ammo does increase its cost, buying in bulk can still save you money. As with all orders over $99 at AmmoMan.com, this case ships for free with no S&H charges tacked on at checkout.